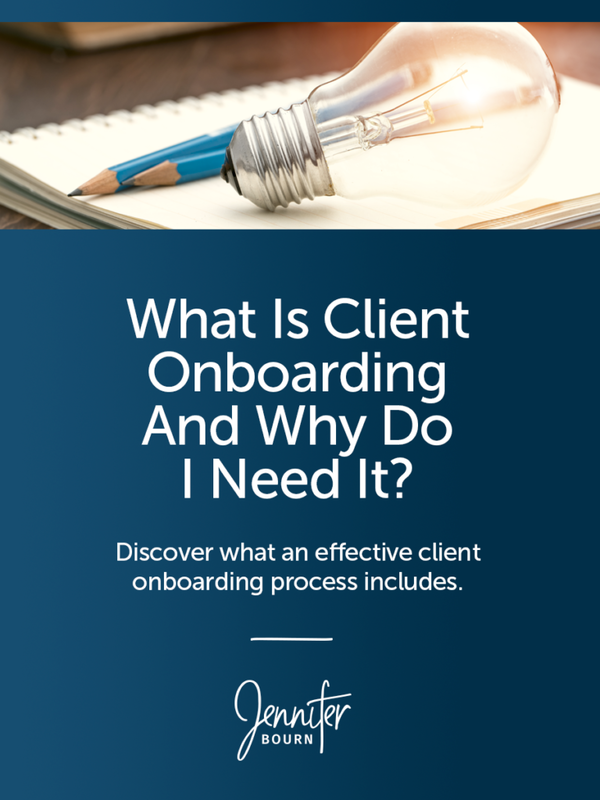 Learn what client onboarding is and discover what should be included in an effective new client onboarding process. Every service provider wants their clients to feel empowered, happy, and comfortable and to have an extraordinary experience — one that turns them into raving fans who refer you to their friends, colleagues, and social networks. Creating an extraordinary client experience begins the minute a new client signs their contract and pays their deposit. It begins with the onboarding process. As onboarding has become a more widely understood concept, it has become a buzzword and somewhere along the way, people began confusing onboarding with positioning and lead generation. Creating a portfolio, showcasing testimonials and case studies, making your website easy to navigate, using a dedicated inquiry form, and actually getting prospects to fill out the inquiry form are part of the prospecting and lead generation process, which are part of your larger sales and marketing strategy. These items are NOT part of your client onboarding process because the target for this content is not yet a client. Onboarding deals with your actual paying clients. It begins when the contract is signed and the deposit is paid and ends when the work begins. Client onboarding is the process of welcoming new clients to your business and getting them up to speed so you can work together effectively, get all of the information you need, and have a great relationship. During the onboarding process, new clients acquire the necessary knowledge, understanding, and tools needed to be a good client and you acquire the necessary knowledge, understanding, and tools needed to be a good service provider. At the most basic level, client onboarding is simply a fancy name for the process of getting started with a new client and completing all of the project kick-off tasks. It isn’t meant to replace or eliminate personal interactions with your clients but supplement and enhance them. A step-by-step onboarding system is proven to increase confidence and satisfaction, improve productivity and performance, and reduce stress and confusion — and not just for clients, but for service providers too — because it prepares the clients for your work together. How your clients feel about the start of their project will set the tone for your long-term relationship. If doesn’t go smoothly, overcoming uneasy or negative feelings will be very difficult. Clients want to feel good about their decision to invest with you. Starting out with a clear process and detailed communication will help solidify their confidence in you, reaffirm that they made the right choice to hire you, and eliminate any confusion over scope of work, terms, availability, and what happens next. The primary objectives of client onboarding are setting expectations, establishing boundaries, communicating process, and providing education. There’s no time like the beginning of the project to make sure all stakeholders are on the same page. By setting crystal clear expectations and boundaries up front, you can reduce or even eliminate potential hurdles and avoid “sticky” situations. While the discussion of these topics aren’t always comfortable or fun, the key is to be firm, fair, and friendly. Your clients will appreciate your professionalism and clarity. External Onboarding — What the client needs to set the project up for success. Internal Onboarding — What you need to provide an end product that delivers the results desired along with a memorable experience. Welcome note — Send a welcome email and a handwritten welcome card by snail mail. Kick-off call — Schedule a quick 10 minute project kick-off call to connect personally with your client and communicate key project information. Expectation and boundary setting — Be upfront and crystal clear about exactly what your clients can expect from you and what you expect of them, as well as when you are and are not available. Process review — Remind clients of the process you will follow for the project. Extra training — Provide your client educational materials to help them get the most from their investment and be a great client. Client questionnaire — Gather detailed information about your client’s business, brand, target market, website, and objectives. Many service providers make the mistake of sending the new client questionnaire first, right after the deposit is paid. The problem with this approach is that often your clients open the client intake form, look at the questions, feel overwhelmed, and set it aside to complete later. But later turns into a few days, which turns into a week, which sometimes can turn into a month or more. Notice the new client questionnaire is last in my external onboarding outline, not first. When I noticed that multiple projects were encountering delays due to client intake forms not being completed on time, I reached out to find out what was going on. My clients shared that this was the first time they had been asked to think about their business so deeply and because they didn’t feel prepared to answer some of the questions, they procrastinated. After hearing that, I overhauled my client intake process. I moved the client questionnaire to the end and added educational materials to help them learn more about websites and what makes websites successful, and to start thinking about their business and brand more strategically. By shifting my approach and providing education before the questionnaire, the delays projects were suffering from disappeared and clients felt better equipped to answer my questions. In fact, many clients have shared that simply filling out the questionnaire gave them so much clarity, that it alone was worth the investment. CRM documentation and tagging — Add the client to your CRM system and tag them with the appropriate tags. For example, you may tag them with common keywords such as client, WordPress, and holiday gift, as well as more specific tags such as the name of a plugin used on the project. Welcome client — Setup a welcome card reminder that emails you or a team member the client’s name, what they bought, and their mailing address. Kick-off call — Use a calendar service like Calendly to invite your client to schedule their kick-off call and set it up to automatically add the calls o your calendar. Project management — Set up the client project in your project management system. Depending on the system you use, you can automate this process and leverage project templates and master to-do lists. Project list — We keep a company-wide project list detailing all current clients, open projects, deliverables, and the status of each item. Keeping this list updated is critical to our workflow schedule and planning. Development environment — With every new WordPress project, a new development account needs to be created. It’s important to remember that your clients don’t have your expertise or background. This may be their first time hiring a professional designer or building a website and they’re more than likely a bit nervous. An onboarding system with clear, simple communication is the key to quickly establishing common ground, providing the client extra education to help them feel comfortable, empowered, and excited about the project, and recap the scope of work, the process, and what comes next. Once again, onboarding welcomes the client, gets them up to speed, and prepares them for the rest of your work together. If you’re ready to add a powerful onboarding system to your web design business, but don’t want to do all the work to create it, I invite you to check out Profitable Project Plan, which includes an entire onboarding system already created, written, and ready to use right away!